Despite the sweltering heat, I donned long pants and long sleeved shirt buttoned up high for my first day at work. Didn’t want all my tattoos giving a boss I had never met the wrong impression. But getting to work required a flight to Australia’s most remote and northernmost administration centre. From my flight from Hobart to Melbourne, through to Cairns in North Queensland, I slept over to catch my last flight northwards again above the tip of Cape York to Horn Island. My window seat looked out at the propeller of my small aircraft as we passed over some of the world’s wildest terrain. I could wax lyrically about turquoise ocean and blanket of green velvet rainforest – but I won’t. Whenever I fly it amazes me how quickly it becomes dull. After all it is one of the most amazing engineering feats our species has ever managed to accomplish, but it still becomes as tedious as a bus ride. But my last leg of some 800 clicks was filled with trepidation of my new life, of leaving friends and family, my wife and little daughter who I wouldn’t see for three months. Was I mad, was this the right decision? This was a wild frontier with crocs and sharks and Queenslanders. Landing on Horn Island the first thing I noticed was nothing, there was so much of it. Scraggly scrub interspersed with three metre high termite mounds. Stepping off the plane and crossing tarmac I noticed a large sign on a cyclone fence saying I was in Kaurareg Country. I became acutely aware of my suburban Caucasian-ness. I was now the minority and would be for the foreseeable future.I could feel eyes burning into me, or more likely it was just my uncomfortableness of being somewhere unknown and unfamiliar, welcome to the real Australia, the one we all pretend to have affiliations with (as in Crocodile Dundee) but only from the safety of our lounge rooms at the finger tips of our remote controls. Nobody actually gave me a second glance. 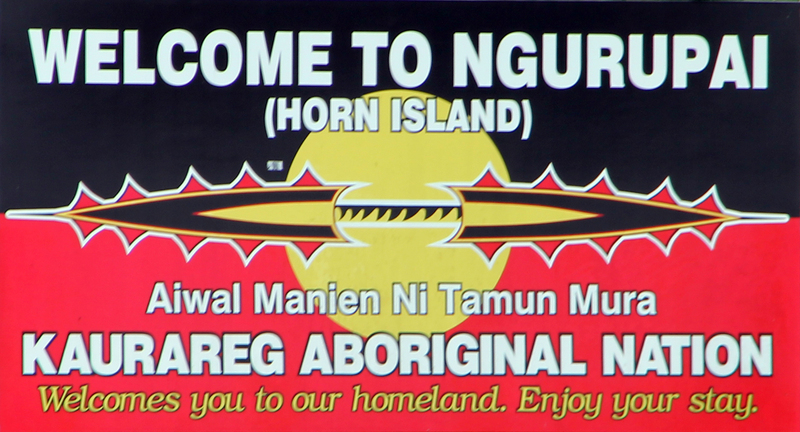 Horn Island, or Narupai has a smattering of 650 people spread over 53km2. In 1802 Matthew Flinders gave the island its European name, based on the shape of Horn Hill, being you guessed it the shape of a Horn. I think it must have been the heat wilting Englishmen in the midday sun that lead to uninspiring names as he circumnavigated terra nullius (didn’t he see all the people?). in the late 1900’s some 6,000 ounces of gold were mined on Horn Island, but when the vein ran dry the miners moved on. Then came the pearlers, which saw a the arrival of experienced divers from many countries, notably Japan, most of who also disappeared with WWII. An Allied airfield saw ironically the Japanese bomb the Island several times. With all its resources exploited the island was again left relatively alone up until the present day. I felt like Harry Dean Stanton in the film Paris Texas as I stepped out of the terminal, blanketed in the dry heat of the savannah like country. My threads barely any better. Climbing on my airconditioned courtesy bus that took us to the ferry, my dusty desert quickly fantasy evaporated. All the Indigenous kids fiddled with their iPods and smart phones and on the widescreen TV the Bee Gee’s comeback tour belted out ‘Staying Alive.’ For the first time since arriving I thought I might just be able to do just that. A fifteen minute ferry ride across to Thursday Island and I was at my new home. At less than 4km2 and with a population of around 3,000, as in the ‘Capital’ of the Strait. 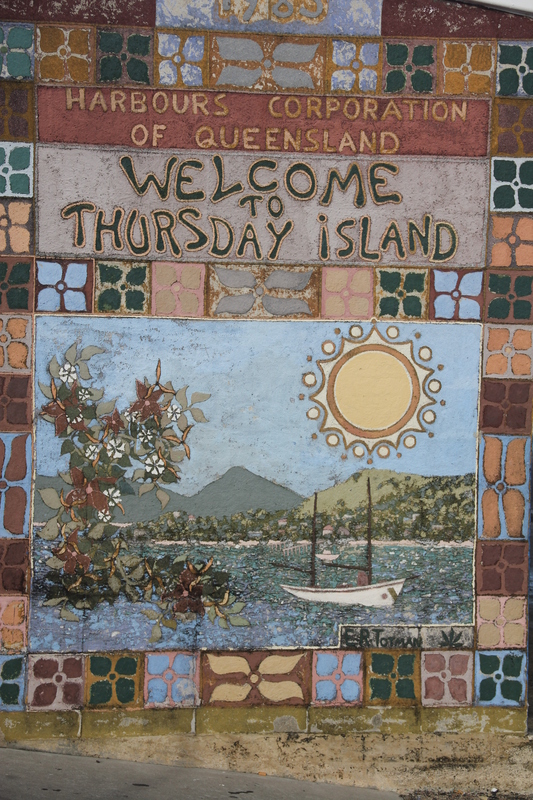 Although it’s not known for sure the origin of Thursday Island odd name (or TI as the locals call it), it probably stems back to when Captain Bligh, exiled by Fletcher Christian’s mutiny on a small boat adrift at sea. Bligh apparently came across the Island on a Thursday, (after coming across Wednesday Island the day before and Friday Island the next day). The traditional owners call it Waiben, I think sounds much nicer. My boss from now on I will refer to as Junior B, his dad, also my boss, is called Senior B. Also my about my age, laconic, lanky with blonde hair in a surfie cut. Junior B has a couple of decades experience as journalist, Senior B close to half a century, makes me feel a tad light wieght with my half a decade of freelance experience. Junior B denied my arrival on Thursday Island on a Thursday was an intentional stunt, just another dose of serendipity. 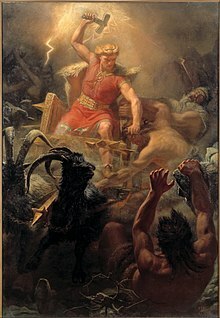 The name Thursday is derived from Old English Þūnresdæg and Middle English Thuresday, which means “Thor’s day,’ the Proto-Germanic god of thunder. How sweet a rumbling angry sky would have been, instead it was slightly over cast with a touch of drizzle – I guess that would have been too much to ask for. Over ensuing days I slowly reduced my strait-laced appearance to shorts and T-Shirt. I Junior B that I guess I would only wear my suit if an important politician came to the island, to which he said, “An Elder’s funeral for sure, but not a politician, I make a point of wearing shorts, T-shirt and thongs.” I made a mental note to do the same. This entry was posted in Strait from the horse's mouth and tagged regional newspapers, Thursday Island, Torres Strait by smithscript. Bookmark the permalink.